Propagandists of Evolutionism, in their attempts to discredit research into the true Biblical foundations of Origins, have often accused Creation Science of being a non-experimental endeavor. This couldn't be further from the truth (not even if it were Lucy's knee joint!). Besides lab experiments involving such diverse fields as hydrology, discontinuity systematics, and design inference (to name but a few,) Creation Scientists also do fieldwork to test hypotheses and gather evidence of God's handiwork. This Summer (2002), I was blessed to be able to take part in some very important fieldwork which I would like to share with my readers. In order to further support the theory of man/dinosaur contemporaneity, I and a group of fellow creation scientists mounted an expedition to the jungles of Africa to track down and bring back photographic evidence of a living dinosaur, thus proving that these Behemoths had indeed survived the Flood as scriptural analysis clearly indicates. There have been previous attempts to bring back hard evidence of living dinosaurs from Africa, including an expedition in 1920 by the Smithsonian Institute, during which four of the expedition members died under mysterious circumstances (the Smithsonian officially denies that any evidence of surviving dinosaurs was uncovered). The other attempts weren't much more successful, with only inconclusive results owning to the difficult conditions of the region, dinosaurian wiliness, and God's Will1. However, since the 1932 expedition to the Congo Basin by famed British cryptozoologist Ivan Sanderson uncovered tantalizing sauropodian footprints, the region has become the focus of the search for what the natives call Mokele-Mbembe and scientists call the Apatosaurus (incorrectly known to fossil-tampering Evolutionists as the Brontosaurus). Diluvian fossil remains of Apatosaurs have only been found in North America, so the reason for their existence in Africa remains a mystery. Perhaps this dark continent was seen by the Lord as a suitable hiding place for these giant creations, who would have migrated to the region from the Middle East under His guidance after the Flood2. Finding the answers to riddles like this was one of the goals of our expedition, and where the previous researchers had failed or come up short, we were certain our prayers would be answered and that God would allow us to finally gaze upon his most magnificent creations. Preparations for our three-week expedition had actually been ongoing since early 2000, as funding and permits for travel in Africa needed to be secured. The expedition's backers -- which included Fellowship University, The Creation Science Museum of Cleveland, and the Fairlight Institute -- decided to assemble an international team of top experts to go out into the field. Besides myself, the expedition consisted of Dr. Helmut VonStoffen, chief curator of the Center for Creation Research in Dusseldorf and expert on overlapping man/dinosaur tracks; Dr. Wen Po, herpetologist and sauropod anatomy expert, who also does missionary work in Communist China; and Dr. Fernando Escobar, transdiluvian ecologist and expert on Noachian migration patterns. Also, two other individuals of less scholarly expertise were to join us. These were: Nigel Stubbingwicke, a British professional hunter and expert on tracking large animals whom we hired through his advertisement in the back of African Hunter Magazine, and "Johnny" Kimbuso, our African guide and translator who was also to serve as the expedition's cook and gopher. Our team assembled on schedule on August 6th in Kinshasa, from whence we were to travel into the jungles of the Congo Basin via Land Rovers hired in advance for us by Johnny, who was waiting at the airport to greet us. Most of the team had never met in person and knew each other only by reputation, although I had met VonStoffen at a conference on Multiphasic Exegesis in Vancouver some years before. As a group, we looked much like any other Creation research expedition you may be familiar with from your kid's Sunday School science classes or nature programs on TBN. The only exception was Stubbingwicke, who we were not entirely sure was even Christian, much less knowledgeable about Creation Science (unfortunately, our budget was constrained and his needed tracking expertise came cheap). He stood out among us due to his ignorantly boisterous nature as well as his trademark pith helmet, it's circumference ringed with items taken from his prey -- including a tiger's claw, a clump of lion's mane, and what appeared to be komoto dragon scales. While waiting for Johnny's Land Rovers to pick us up outside Kinshasha International Airport, Stubbingwicke expressed his hope to add an Apatosaurus scale to his haberdashed trophies, but we explained to him that our mission was limited to photographic shooting only. Although he acquiesced, I could tell that he was humoring us "naive scientists" and that given the chance he would kill the subject of our research. It was right then that I planned to keep a close eye on this Nigel fellow the whole expedition. These are the sort of conditions our Land Rovers had to face during our trek. It was times like this that I longed for the Christian-built highway systems of home. The trek into the Congo Basin was arduous. I have never been bitten by so many mosquitos in all my adventures as a Creation Researcher! Thankfully, prayer to the Lord kept the malaria at bay. 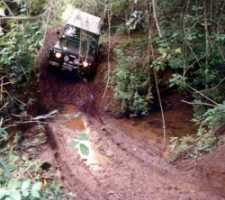 We were headed deep into the jungle, on roads that were barely more than muddy footpaths. Occasionally our vehicles had to be ferried across rivers using rickety boats that the natives constructed out of logs and vines. Having Johnny question the natives we encountered, we pieced together reports of a group of pygmies who had killed and eaten a "dingonek" (as this tribe called the large, long-necked beasts) in a remote village to the North, and it was in this direction we aimed. Not forgetting our greater Mission as Christians, we also stopped at villages along the way to spread the Good News. We relied on Po's expertise in witnessing to animists (which, he informed us, are still shockingly prevalent in some remote areas of China) and had much success in bringing the light of Christ to that dark land. This tried Stubbingwicke's patience, as he made a point of letting us know every time we stopped the Land Rovers to go into a village with our Bibles. It was now quite clear that Stubbingwicke was stricken with a stubborn case of the mental disease of Atheism and that he might prove a hinderance to our research. Nevertheless, we witnessed to many natives unfamiliar with Jesus, as well as some whose only contact had been with Catholic Missionaries soft on Evolutionism. After setting them straight, we continued on our journey. A full week of our expedition was spent searching the jungle for the village of the dingonek hunters as we were sure these pygmies could help us. We eventually ran out of "road" and had to continue into the jungle on foot with the help of porters Johnny had hired from the nearest town. We knew we were in the vicinity of the village, so we trudged on through the thick jungle in hopes of coming across it. Just when our ability to stand the muggy climate and constant insect pesterment was reaching its end, we emerged from a small path into the clearing of a village. We had finally found it! Johnny looks for signs of life in one of the abandoned pygmy village huts. But something was amiss. There was no one in the village. We looked in all the huts, but the place was abandoned. Befuddled, we had Johnny yell out "hello" in the local idiom in the hope of catching the attention of some hidden villager. After about twenty minutes of no response, we decided to let Johnny rest his voice. We then made camp in the village center, as it was getting quite late. During the night there was a commotion. One of the four porters had heard something prowling around the outer part of the village. The superstitious porters became fearful, thinking that the Mokele-Mbembe had come to steal their souls or something of the like. My team and I, however, knew quite well that the Apatosaurus is a harmless herbivore and that it posed no physical danger (and certainly none to our souls, which we have entrusted to Christ). Still, the possibility that one could be near was very exciting. We equiped ourselves with flashlights and cameras and went out into the night to investigate. Stubbingwicke insisted on bringing his rifle, even though we all said it was unnecessary. As we circled around the perimeter of huts that formed the outline of the village center, VonStoffen heard a noise in the bushes. Slowly we crept up behind a woodpile so as not to startle whatever it was. We listened carefully, hoping to hear characteristically sauropodian sounds (although, in retrospect, we would not have known them if we had heard them.) What we heard instead was a cough. A human cough. All at once we shown our flashlights on the bushes where the sound came from. This elicited a scared sounding yelp. At my prodding, Johnny asked in the native language the equivalent of "Who goes there?" To our chagrin, a small, elderly, native man slowly walked out of the bushes, naked and seeming quite disorientated. We took him back to the village center and gave him water, some of our rations, and a Habu Missionary Gear shirt and pair of Zounds shorts to cover his nakedness (fortunately we had brought a supply of these along to barter with the natives for information). Questioning him through Johnny, we learned his story and that of the village. What we had heard was true: these pygmies had indeed killed an Apatosaurus. The villagers had carved up the dinosaur where it was felled and brought its carcass back to the village for a great feast in honor of the warriors who had killed it. The day after the feast, something strange started happening. One by one, the villagers became ill with a fever and shortly thereafter died. Ignorantly fearing that the spirit of the beast had cursed them, the few villagers still able to stand gathered up all the Apotosaurus remains and took them to some hidden place to the South to perform cleansing rituals to their false gods. But, obviously, this was useless and the remaining villagers soon died as well. Being unencumbered by the native superstitions, we knew that what must have really happened was that the warriors had killed a diseased Apatosaurus, as no band of these pygmies could take down a healthy giant. It must have been quite sick and its flesh tainted. Fortunately for the old man, he had no teeth and was not able to partake in the disgusting feast. His lack of dental hygiene had spared his life! His fellow villagers had left him behind before going off to bury their dead and perform their last blasphemies, and upon our approach he had hid himself in the bushes thinking that we were in league with the beast's spirit. 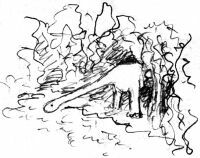 That morning, we decided we would go into the surrounding jungle and look for the Apatosaurus remains and any other surviving pygmies. Surely the sick villagers couldn't have gone too far. We equipped ourselves lightly and ordered the four porters to remain behind to watch the camp and tend to the elderly native's needs. We brought Johnny with us just in case we ran into any more natives. Stubbingwicke again brought his weapon, as well as a large serrated knife strapped to his thigh, which he said was for protection against jungle snakes, although I suspected what he really had in mind to do with it. We headed South into the jungle, taking a barely visible path that the elderly native had indicated as leading to the ritual site. Soon there wasn't a path at all and we resorted to using machetes to make our own. At some point we must have gotten turned around and we became lost. Thinking it best to return to the village and requestion the old man, we started to back-track as best we could. Po and Escobar got ahead of VonStoffen, Johnny, and myself. Stubbingwicke was hanging back, muttering under his breath. I think I heard a few anti-Christian remarks from him, but I was not certain at the time. We heard a jarring call from far up ahead. It was Po. He was yelling something in Chinese that I couldn't understand. Fearing that he might be in danger, we lunged forward through the thick jungle, hacking at the branches and vines with our machetes to reach the source of his call. When we finally found our way out of the vegetation to the swampy clearing where Po was standing -- more ashen than yellow and still yelling in incoherent Chinese -- there was nothing to be seen. Escobar had gotten to him first and was already trying to calm him down and get him to explain to us in English what was the matter. The first understandable words to leave his lips were hushed and determined: "I saw it". Dr. Wen Po's sketch of what he saw. According to Po's description, the creature was 7 feet tall at the shoulders. It had a long, thin neck, between 8 and 10 feet in length, which supported a relatively small head that swept back and forth across the ground, munching weeds as it traveled. (It's stature was smaller than that of diluvian remains found in North America; could it have been a juvenile? or perhaps the degradative forces at work in the jungle that had shrunken the pygmies since their descent from Noah3 had also affected these modern Apatosaurs?) It had been standing at the opposite edge of the jungle clearing, perhaps not willing to walk into the mucky middle for fear of becoming stuck. Po's initial scream of Oriental surprise had undoubtedly startled the beast -- the harsh and discordant sound of his language had certainly startled us when we heard it from a hundred yards away. 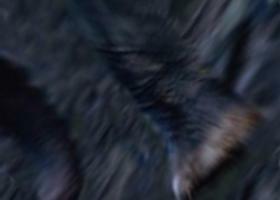 Po had seen it timidly skulk off into the jungle, moving more silently than one would expect from its large size. (Actually, as Po explained to us, its stealthiness is not unexpected to those familiar with Apatosaur anatomy, as the creatures walk on their toes much as elephants do.) Sure enough, looking across the swamp we could see a break in the jungle where something large had muscled through. Unfortunately, Po didn't have the presence of mind to stop yelling and take his camera out. I cannot blame him for this, as it must have been a mighty sight to behold, one that would have filled the soul with awe at this most magnificent creation of the Lord. I cannot honestly say that I wouldn't have acted the same had I been in Po's shoes. Nevertheless, we were ecstatic at this close encounter of the dinosaur kind and knew that we were finally going to vindicate Biblical research over the naysaying of the Atheistic hegemony of the paleontology establishment. While Po was regaling us with what he had seen, I heard Escobar off-handedly ask "Where is Señor Nigel?" I looked around and couldn't see Stubbingwicke anywhere. Had he not caught up to us in the clearing yet? No. Although my attention was obviously diverted, I was certain that he was at my side as I finally broke through the jungle. Then it dawned on me: earlier at camp Stubbingwicke had boasted to Po of hunting giant salamanders near Guangdong in China without the assistance of a native guide. Could it be that he spoke Chinese? Did he understand from Po's screams what had happened while we were still trying to calm Po down to get an English answer out of him? Had he snuck off to hunt the Apatosaurus? Was he going to use that knife of his to get himself a trophy? I was sure this was the case. I quickly informed my colleagues of my fears and strongly suggested we immediately go through the dinosaur-sized hole in the jungle and find Stubbingwicke before he did anything rash. Against the protestations of our fearful guide Johnny, we did just that. 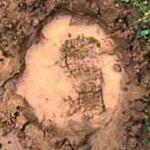 Dr. VonStoffen managed to quickly snap a shot of this Apatosaurus footprint at the mucky edge of the forest. He noted that the boot print overlapping it was that of Stubbingwicke. I felt like Jonah as I entered the mouth of the Apatosaurus trail, only instead of trying to escape God's commands, I was following them above and beyond His call. The trail formed a dark, green tunnel through the jungle, occasionally lit by shafts of light breaking through a groove above -- was this where the beast's uplifted neck sliced through the canopy? The sides of the trail threatened to close in on us like a leafy vise as we dashed across the trampled branches that strewn the ground. And there was a stench -- an unbelievable stench! -- that slithered up our nostrils like some ravenous tree snake looking for the small furry rodents that were our olfactory nerves. After a few minutes of running down the seemingly endless trail-tunnel we discovered the disgusting source of this foul odor. There in the middle of the trail was a steaming, heaping pile of something that I dare not say in mixed company, undoubtedly deposited recently by our quarry, perhaps as some sort of defensive behavior. While in better circumstances we would have stopped to get a sample of this physical evidence (oh, what we would do in the name of Creation Science! ), we knew much more was at stake up ahead so we held our noses and sidled past. Eventually the tunnel opened onto a larger cavern trampled out of the jungle, lit by mottled light from above. This seemed a hub of a network of Apatosaur trails as other tunnel openings led off in various directions. We entered the center and stood there not knowing which way to go. We decided the best course of action was to split up and each take one of the four new trails. I called Johnny before the others had a chance, so he was to go with me. As I had the assistance of the African guide I chose the darker, more ominous trail immediately to the right of the one we had come up. Johnny was not pleased with this, but I assured him that Apatosaur were harmless. My unspoken worries, however, were of Stubbingwicke: would he willingly give up the hunt or would I have to fight him, mano a mano? While I am no slouch when it comes to fisticuffs (I was on the varsity boxing team back in my college days,) Nigel had weapons and exhibited decidedly un-Christian tendencies. As Johnny and I headed down the dark trail I prayed to Jesus for guidance and strength while readying my fists for action. This trail was much darker than the previous one and the ground was muddier, as though it had been well trodden. In some places the muddy ground was worn so thin that queerly weathered rock was exposed -- rock that perhaps was shaped millennia ago during the Flood. My hunch was that it was an older trail, the darkness due to the regrowth of surrounding vegetation. It seemed to be heading downward, as if into a valley. Secure in my Faith, I plunged down into this valley of darkness, Johnny barely able to keep up. Finally, after rounding a bend, we found them. Below on the side of the trail was Stubbingwicke, hunched behind a branch with his rifle trained on something large further down in the darkness. Although I could see barely more than shadows, I knew what it was and what was happening. He was about to shoot the Apatosaurus! "Put down that weapon! The power of Christ compels you!" I immediately commanded, the words flowing through me as if from Above. The power of my rebuke startled both him and the Apatosaurus, causing the former to turn toward me and issue a blasphemous curse while the latter disappeared down the trail. Before Stubbingwicke could notice that his prey was escaping, I ran to head him off. Now between him and the beast, I dropped my gear, rolled up my sleeves, put my fists up and issued a challenge: "If you want that dinosaur, you will have to get through me first!" Seeing that he had no choice but to deal with me, Stubbingwicke dropped his weapons, uttered some more blasphemies, and came at me with his fists. As I engaged him in fisticuffs, I called out to Johnny to take the camera and hurry down the path to get a photo, which the now-panicked guide nevertheless did. "Do you seriously believe that we don't already know about these dinosaurs? Why do you think I agreed to come along on this little Christian adventure of yours? To make sure you don't get what you came for, that's why!" Stubbingwicke was an Evolutionist! What's more, he was involved in a conspiracy to stymie our attempt to uncover evidence that would vindicate Creation Science. But who exactly was he working for? The NCSE? The Smithsonian? The American Atheists? The usual suspects fluttered through my mind like bitter, God-less butterflies as I reeled from this revelation. But I was soon brought back to the moment by a scream from down the trail. It was Johnny. Glancing between Stubbingwicke and the dark trail below, I realized I had to leave my foe there and go to Johnny's aid. When I found Johnny he was lying, arms akimbo, on the ground near what looked to be the end of the trail. There was no sign of the Apatosaurus. There were some very dark breaks in the jungle around us, but none of them could charitably be called trails. If the dinosaur had went through one of them, he was lost to us for sure. There was somewhat more light here than back up the trail, and I could see that Johnny was badly bruised, but otherwise okay. I helped him to his feet, asking what had transpired during my battle. Johnny was very confused and agitated but I was able to gather that the Apatosaurus had charged at him -- no doubt feeling cornered in this dead end -- and had knocked him to the ground before disappearing. I pressed him about the camera, perhaps shaking him a bit more than was necessary. I had to know if he got a photo! He said that he managed to press the camera's button -- more on accident than purpose -- during the beast's attack, but was unsure if the photo would show anything of worth. There was still some hope. With nothing more to be done there, I walked Johnny back up the trail. Unsurprisingly, Stubbingwicke was gone. When we reached the hub of trails, we rested until Escobar, Po, and VonStoffen returned and then told them of what had happened. We all agreed that looking for the dinosaur further would be futile and that it would be best to return to camp. We had hoped on the way back to gather some of the pungent physical evidence that we had previously encountered, but when we arrived at the spot all trace of it was gone (with the unfortunate exception of its stench). We suspected the work of Stubbingwicke. It took us a while to retrace our steps through the jungle, but we managed to lumber into the pygmy village just before sundown. The porters told us that Stubbingwicke had returned a couple of hours before we had, smelling horrendously. He had gathered his belongings in a hurry and left, taking one of the Land Rovers with him. We would never hear of him again. Johnny had come through for us! Here is the first ever photo of a living, breathing, charging dinosaur. Admittedly, it's not the clearest picture in the world, but it demands further investigation by even the staunchest skeptic. We bid Johnny farewell and returned to our homes triumphant. But still, much more research needs to be done, not only into the ecology and distribution of extant dinosaurs but also into Stubbingwicke's revelation of conspiracy. I suspect that powerful forces are at work trying to stop us. But we have the Lord and Truth on our side, so our success is assured whatever trials may be in store for us. In the future, if we can secure the funding, we hope to continue our research in more-accessible Puerto Rico, where Dromaeosaur attacks on livestock are commonly reported. This time we will be more careful whom we invite along. « [ADDENDUM 2/4/2004] See Creation Generation's Expeditions section for an overview of previous dinosaur expeditions in Africa. « Interestingly, the etymology of "Mokele-Mbembe" derives from "rainbow" in the native tongue, and has since taken on the additional meaning of "one that stops the flow of rivers." Could it be that it was given this name by these African descendants of Noah's kin out of some hazy historical memory of the Covenant that survived their degeneration into animism? More research on this important anthropological evidence is certainly warranted, but beyond the scope of this article. « For more on the post-diluvian origin of human racial characteristics, see The Origin of the Human Races published in the peer-reviewed journal Creation Ex Nihilo and the article "How did different skin colors come about?" by Ken Ham, Jonathan Sarfati, and Carl Wieland.